Stop me if you’ve heard this before, the Pittsburgh Penguins have problems with injuries. They’ve been one of the most injured teams since the 2009-10 season and their luck hasn’t changed this season. And it hasn’t been the depth players struggling through injuries, it’s their stars like Sidney Crosby, Evgeni Malkin, Kris Letang, Pascal Dupuis and even Chris Kunitz to some extent. 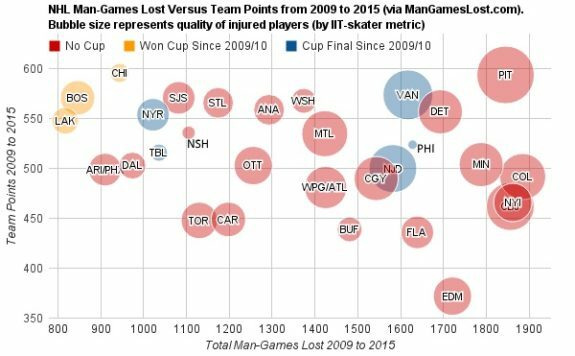 If you look at the impact these injuries have had on the team, they’ve been the most impacted team in the NHL. The above chart takes into account not only the sheer amount of time that players have missed, but also their impact to the game. In other words, when star players miss more time, it has a greater impact on the team. And the Pittsburgh Penguins seem to be cursed. Let’s look at which players have missed time due to injury and the number of games missed. For the most part, the Penguins star players had avoided injuries this season until recently, when Malkin, who had just returned from injury, suffered what is believed to be a broken hand or wrist in the 3-2 victory over the Columbus Blue Jackets. Pens have played in 108 playoff games since 2007. Malkin has been healthy enough to play in 101 of them. Unfair to question his durability. Here’s the thing about the 2015-16 Penguins, they’re not built to lose a player like Malkin, especially when the playoff race is heating up, but that doesn’t mean they can’t survive without him. No team is going to play as well when they lose their second best center, especially one who would be the top center on most other NHL teams. However, these Pittsburgh Penguins have shown that they won’t be defeated easily. Under Mike Sullivan, the Penguins have done something they failed to do under Mike Johnston, they’ve come back from deficits, they’ve fought and clawed their way back into games. That same type of drive has led Sullivan to describe the play of some young players as “inspiring.” And that’s where this team differs from teams in the past, they’re utilizing young talent and it shows on the ice, for the most part, and not recycling veteran players like they’ve done in the past. Yes, it’s true that the strategy of “recycling veterans” never put the Penguins outside of the playoff picture, like this team has been at points this season. But the difference is that the Penguins are finally playing their youth and offering them experience now. How have teams like the Chicago Blackhawks, Los Angeles Kings and Tampa Bay Lightning been so competitive in recent seasons? They play their youth during the regular season, and yeah sometimes it doesn’t lead to the best regular season record, but the experience they get gives them confidence in the playoffs. After an 82 game season, many veteran players aren’t skating with the same explosion they did early in the year, and that’s where youth will shine. Their legs will still be under them and after playing almost half of the season, they’ll be confident. If the Penguins make the playoffs, watch out. They’ve been an up and down team over the last few months, but that’s what happens when you let youth play, and play a lot of minutes, there will be inconsistencies in their game and overall team play, but overall this will benefit the Penguins moving forward. Losing a player like Malkin hurts the team, but it also opens up opportunity for more of the Penguins young players to get experience. Let’s also not forget, when one of the two main centers is out of the lineup, the other takes their game to an even higher level. As long as Sidney Crosby remains healthy and producing, this team has a chance to push for the playoffs.